Profile: All glass at Shakspeare is blown by hand. Although the technology has obviously improved the tools and techniques have not essentially changed since Roman times. Each piece is blown from recycled lead glass and the colour is added in the making process in a variety of different ways. The patterns that we use in our designs are deliberately random to emphasise the individuality of every piece that we produce. It is an aspect of the work that is particularly important at Shakspeare Glassworks, that every piece should be special in its own right and not one of hundreds or even thousands churned off a production line. 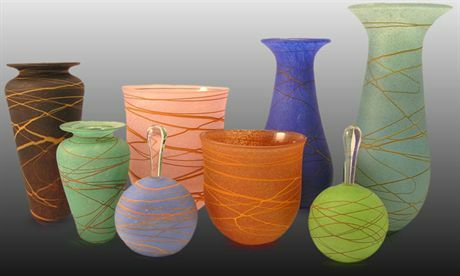 At Shakspeare Glassworks the maker try to incorporate the natural flow of glass as a material and then enhance it with the colours and designs that we use.